Carolyn Porter | April 1, 1944: Yesterday there was beautiful sunshine and today, for April Fish, we have grey weather and fine rain. 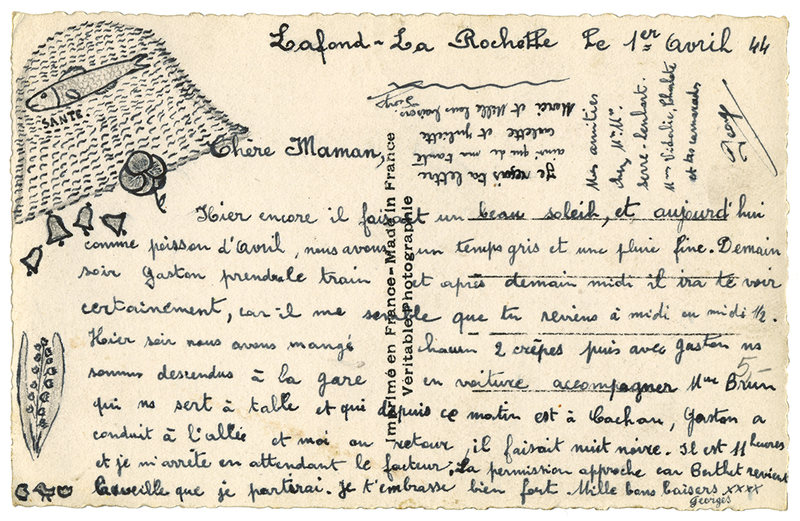 See/read a postcard written April 1, 1944 that includes a hand-drawn fish in a basket, Lily of the Valley and a newly hatched chick. WWII postcard, handwritten postcard, April Fish, April Fools, April Fools Day, 1944, Lafond, La Rochelle, Carolyn Porter, "Marcel's Letters: A Font and the Search for One Man's Fate"
Yesterday there was beautiful sunshine and today, for April Fish, we have grey weather and fine rain. Tomorrow night Gaston will take the train, and after tomorrow noon he will go see you for sure. It seems to me you come back at noon or 12:30. Last night we each ate 2 crepes, and then after, with Gaston, we went down to the station by car in order to accompany Mrs. Braun, who only serves a table, and since this morning is in Cochon. Gaston drove to the alley and by the time I returned it was dark night. It is 11:00 and I’m stopping while waiting for the mailman. Furlough is coming near because Berthet comes back the day before we’ll leave. I kiss you real well. A thousand good kisses, XXXX.